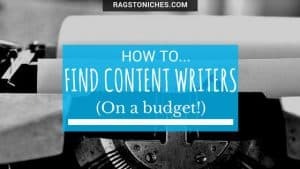 Hirewriters Review: Legit Content Mill, Or Scam? Last updated on October 19, 2018 By Nat 8 Comments This post may contain affiliate links. We appreciate you supporting Rags To Niches! Full disclosure here. Is Paribus A Scam? Or Legit Opportunity To Save Money? Last updated on July 25, 2018 By Nat Leave a Comment This post may contain affiliate links. We appreciate you supporting Rags To Niches! Full disclosure here. 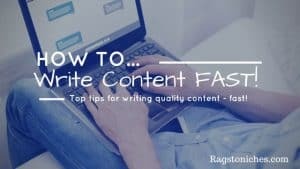 Last updated on December 31, 2018 By Guest Writer 6 Comments This post may contain affiliate links. We appreciate you supporting Rags To Niches! Full disclosure here. 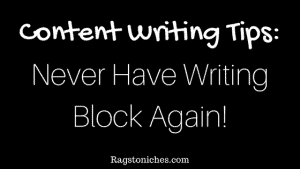 Content Writing Tips: Never Have Writing Block Again! Last updated on December 31, 2018 By Nat 1 Comment This post may contain affiliate links. We appreciate you supporting Rags To Niches! Full disclosure here.